The sun is shining. And you’re miserable. Runny nose, aches, sneezing. This cold keeps hanging on but you aren’t sure why. But is it a cold? 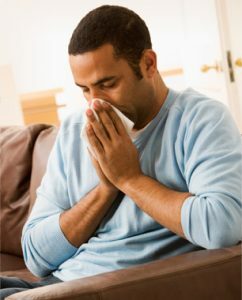 According to MedExpress Urgent Care, a neighborhood medical care provider with more than 250 centers in 20 states, an early allergy season paired with a late cold and flu season can cause symptoms such as runny noses, sinus pressure, and headaches to overlap − making it difficult to tell the difference between late winter colds and early spring allergies. Keeping windows and doors closed to prevent pollen from getting into the home once warm weather hits. Showering and changing clothes before bed to remove allergens that might cause irritation overnight. Regularly monitoring local allergy forecasts for high pollen counts. Avoiding early morning outdoor activity − a peak pollen time. Avoiding dry, windy days, which can send pollen flying into eyes and nostrils. A walk after a rainstorm can provide relief since rain washes away pollen. It’s always best to check with a healthcare professional to figure out what’s causing those sniffles. Many seasonal allergy symptoms are easily treated with routine or prescription medications such as nasal steroids and antihistamines; however, some allergies may require an interaction with a healthcare professional to determine if further care is needed. MedExpress centers are staffed by a full medical team to help allergy sufferers find relief. With no appointments necessary and most insurance accepted, allergy and cold sufferers can just walk in at a time that works best for them.